Nestlé, Enfamil, and Similac have sent us what feels like four households’ worth of formula samples and coupons. But why bother with formula when breastfeeding is free? In a similar vein, why buy “stage one” baby cereal and prepare purées when I can just give Ashelyn morsels of what I’m eating? And our tooth count is still at zero! Ashelyn’s a good sport and has yet to refuse anything we offer. (I thought pomelo and egg yolk were misses, but she seemed to like yolk when it showed up again on the menu. As for pomelo, we haven’t gotten our hands on another one since the initial try.) The sour gollum face has mostly been replaced by the frantic MMH! MMMHH! that means food not coming fast enough. How genius is a bib with sleeves? I think we hit the jackpot with this girl – she doesn’t even make much of a mess when she eats! 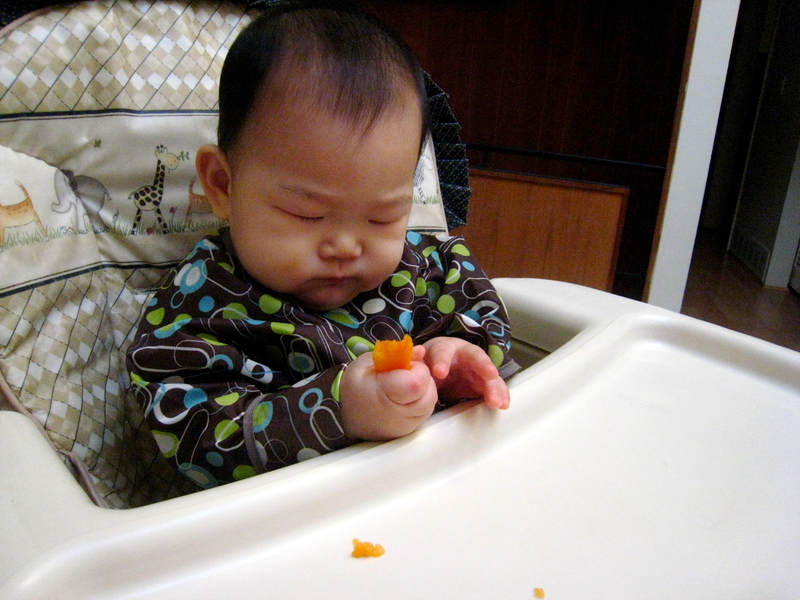 In fact, she gets kind of weirded out by squishy foods sticking to her hands. I know baby-led weaning is supposed to be baby self-feeding, but Ashelyn doesn’t mind if we pop a bite directly into her mouth, either. In the early months, most of the unsolicited parenting advice I received revolved around breastfeeding and having enough milk. 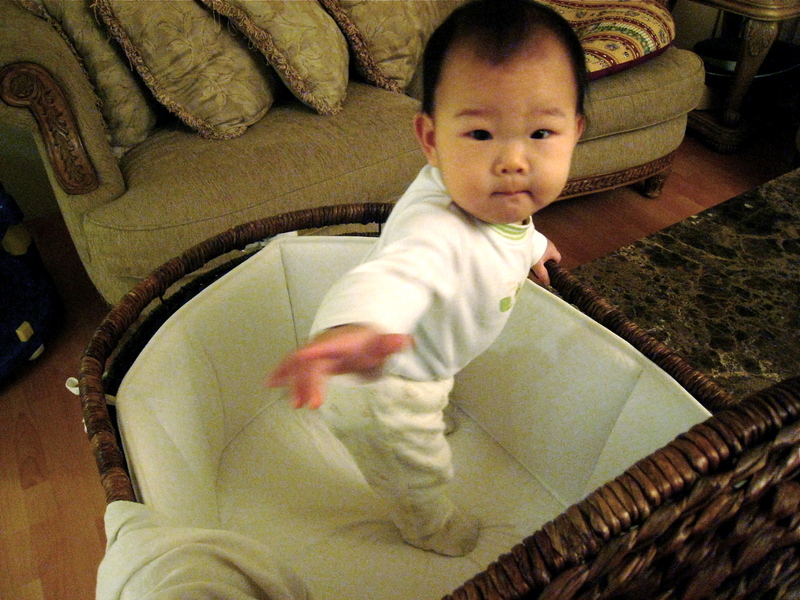 Lately it’s all about … standing? See, Ashelyn mastered pulling up at around six months. She loves being upright, loves to stand and walk while holding onto our fingers. 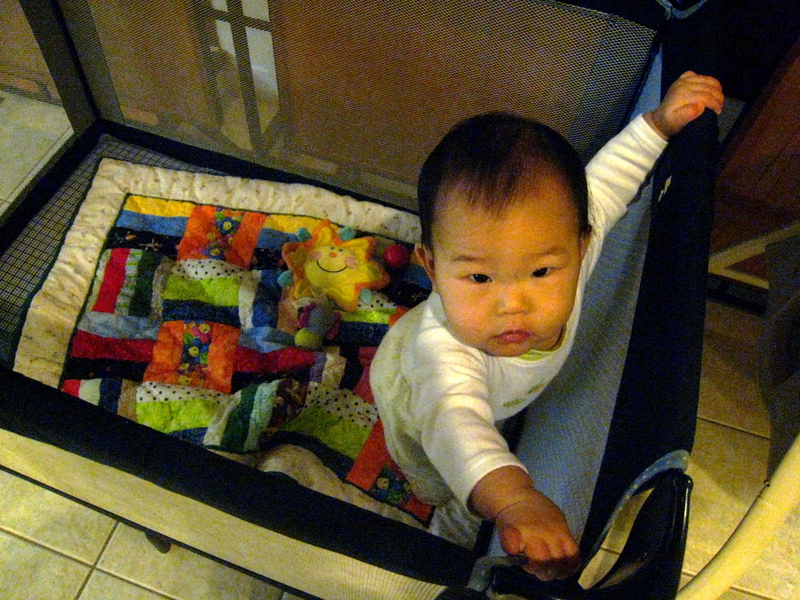 I’ll set her down in the crib or playard, and three seconds later she’s peering at me over the edge. So I’m getting a lot of flak from people who say that it’s too early for Ashelyn to stand, that because her legs aren’t yet fully developed standing will cause them to become crooked. And then I’ll have a bow-legged child. Once I was even told that any standing before the age of one would stunt her linguistic development. Seriously, where does this stuff come from? Because my understanding was that it’s normal for babies to be a little bow-legged from being squished inside the womb. And that the legs will straighten soon enough – helped along, in fact, by the redistribution of weight that comes from standing and walking! Besides, how am I supposed to keep Ashelyn from bearing weight on her legs if that’s what she wants to do? Am I to push her over when she pulls up? Because I can hear the resultant screaming already. That’s my complaint about this kind of alarmism, I think. New mothers tend to have pretty fragile psyches, and words like that – well-intentioned as they may be – stoke issues of fear and insecurity. Then, in the drive to be safe over sorry, to do everything right, all the joy is drained out of baby’s first year. That’s a lot of joy to be cheated out of, really. So I discard a good 95% of what people tell me, without guilt, and I’m able to relax and savour this brief time. I heeded my midwives, I trust our family doctor, and I have a robust filter for internet misinformation and pseudoscience. And I know my daughter.